Undi or Oondi is a popular Konkani breakfast recipe of steamed rice dumplings. 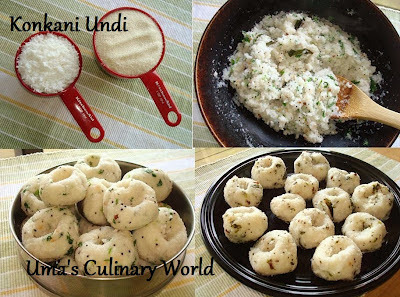 This recipe is somewhat similar to Idlis, but takes lesser time and needs no fermentation. I generally prepare Undis for lunch and serve it with a spicy curry or chutney. While I was in Mangalore, I came across its Tulu name - Pundi Gatti. Finely chop cilantro leaves and pat the curry leaves dry. Heat about 2 tsp oil in a pan. Add mustard seeds, urad dal, methi seeds and curry leaves. When mustard seeds splutter, add 3 cups water. Add salt to taste. When water starts boiling, add idli rava gradually and stir simultaneously. Cook it covered at low heat for 2 - 3 minutes or until water is absorbed. Lastly, add coconut and cilantro. Continue cooking until idli rava absorbs all the water. Turn off the heat and let the undi mix cool. You can add more oil and roast the idli rava if you like. For Undi, the proportion of coconut and idli rava is 1 : 2. Coconut adds the desired softness to undi. Along with curry leaves, you can add chopped green chillies too. Divide the undi mix into 20 parts. Roll each one into a round ball and form a small hole in the center. Grease a vessel used for steaming with cooking spray or oil. Place the round balls in the greased vessel and steam the undi for about 10 minutes. You can use a pressure cooker or an idli cooker for steaming. Serve hot Undi with Coconut Chutney or a spicy curry of your choice. Wow wat a healthy and inviting konkani undi..
so good n so healthy.. Healthy recipe,new to me,thanks for sharing.